Debt recovery organizations can recoup up to 40 percent more debt, locate more debtors, shorten the collection cycle and improve their operational efficiency using Accurint® for Collections. LexisNexis® Risk Solutions associates are accessible 24/7 through a variety of convenient resources including a toll free number, e-mail and live chat. 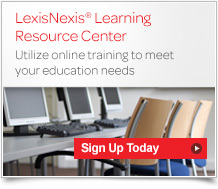 Visit the LexisNexis® Learning Resource Center, a complimentary interactive, self-service website which allows you to easily view, access and engage in a variety of training experiences. Reduce your risks during online interactions, access best practice security tips to help you protect your account information. Learn more about LexisNexis, visit our news and events page to access articles, press releases and list of events in which we'll be attending. For 24/7 search assistance, technical assistance or security questions please e-mail product support or call 1.866.277.8407. Find out why more than 400,000 public and private organizations of all sizes rely on powerful, industry leading LexisNexis Accurint® to support their business goals. Read more by selecting your area of interest. The Accurint® services are not provided by "consumer reporting agencies," as that term is defined in the Fair Credit Reporting Act (15 U.S.C. § 1681, et seq.) ("FCRA") and do not constitute "consumer reports," as that term is defined in the FCRA. Accordingly, the Accurint service may not be used in whole or in part as a factor in determining eligibility for credit, insurance, employment or for other eligibility determination purposes that would qualify the service as a consumer report under the FCRA.